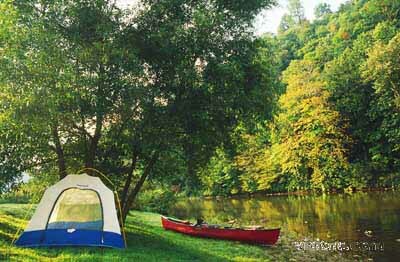 Riverside camping at Whitewater Canoe Rental is available on a limited basis and must be prearranged with reservations and email confirmation. Campers must present email confirmation upon arrival. River camp check-in times are 2:00 P.M. to 8:00 P.M. and quiet hours are 11:00 P.M. 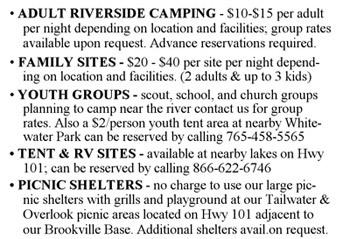 Check out our camping rates, overnight canoe trips, and additional Lake campsites listed below. Brookville Lake (5 minute drive). Call 765-647-2657. Brookville Lake (8 minute drive). Call 765-458-5041. Whitewater Lake (10 minute drive). Call 765-458-5565. Acton Lake (30 minute drive). Call 800-AT-A-Park or 800-BUCKEYE. You can also visit their website. (8 minute drive) Call 513-367-9632. 4244 St. Rd. 227 N.